AVM brings German high-end hi-fi to the UK | What Hi-Fi? PMC is bringing the high-end company to the UK with a range of feature-packed hi-fi electronics. It's not all about British brands at the Bristol Sound & Vision Show, as proved by the launch of German brand AVM. The company, which has more than 30 years of hi-fi pedigree in its native country, has been launched in the UK by PMC, and was getting plenty of attention at the show for its stylish, single-box systems. AVM, which stands for Audio Video Manufactory (despite not having any video products), will launch with three ranges: Inspiration, Evolution and Ovation. The flagship Ovation range has a mix of products with solid-state and valve amplification. The Ovation SA 8.2 (£11,495) is a power amplifier, the Ovation SD 6.2 (£7490) is a solid-state streamer, DAC and headphone amp, while the Ovation MP 6.2 (£7490, pictured top) adds a CD player. 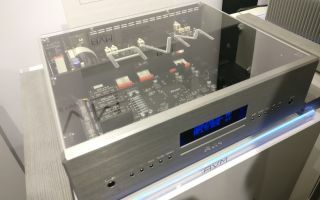 The Ovation CS 8.2 (£10,995) is a class A/B valve-powered system, with streamer, CD receiver and DAC; a "true high end system in one box", according to AVM. At the other end of the product range is the slightly more affordable Inspiration CS 2.2 (£3995, pictured above). This is an amp, streamer and phono amp, offering 130-watts of power per channel, and available with or without a CD drive. The step-up Evolution CS 5.2 (£5490) offers more power and is available as a solid-state or valve amp. There are Android and iOS apps for AVM products, with all streamers having integrated Tidal and Qobuz for CD-quality streams. All the machines will come in a silver finish, with black to order. Find out more on the AVM UK website.